Happy July!!!!! Summer is officially in full swing and if your kids are going stir crazy in the house like mine, you should consider heading to Dolphin Mall. Dolphin Mall is Miami’s largest indoor outlet center featuring over 240 stores and theme entertainment. 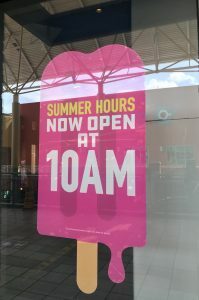 Dolphin Mall is celebrating summer with tons of great promotions and activities for kids. The Stew Crew was super excited when I told them that we were heading to the Dolphin Mall Mommy Blogger event. 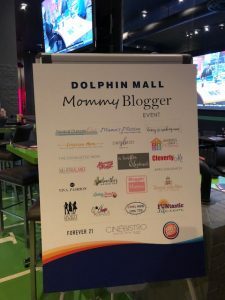 This event gave us a preview of all of the amazing things that Dolphin Mall has to offer. 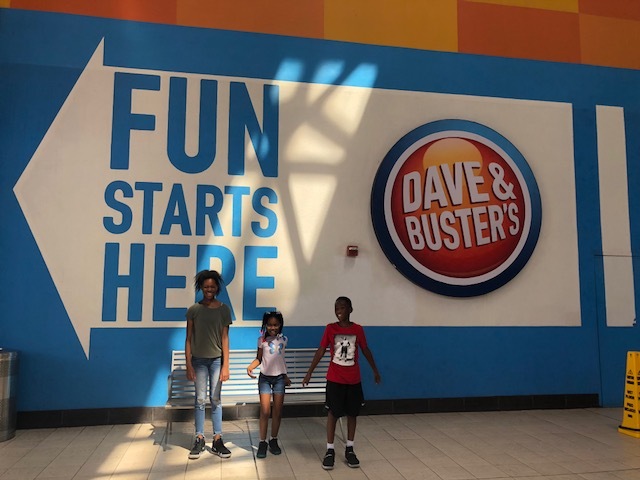 Our first stop was Dave and Busters! This summer they are open early at 10 a.m. This was their absolute favorite part of the day. What kid doesn’t love to play video games all day? There is an exciting new Jurassic Park 3D ride that came out just in time for the movie release. They also added new basketball games, food items and more ways to win those prizes!!!! We played skee ball, table hockey, Mario Brothers, and shot lots of hoops. On Wednesdays, Dave and Busters will offer half price games all day long. Sounds like the perfect place for a play date, right? Next we had about an hour to shop. I really wanted to go to IKEA but everyone knows that you need more than an hour at IKEA. We strolled through the mall and almost every store had some kind of huge sale going on. It was a shopaholics dream come true. Some of my favorite stores there are True Religion, Neiman Marcus and the Saks outlets. It is not easy shopping with 3 kids so I just window shopped that day. We grabbed a little snack from Starbucks and headed to Cinebistro. 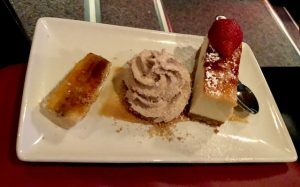 Have you ever been to Cinebistro? It is where dinner and a movie really mean just that. They have an amazing menu full of gourmet dishes and delicious desserts. You can get your traditional movie snacks like candy, popcorn and nachos but you can also have fettuccini Alfredo, cheesecake and a martini. The comfy plush seats and extra room made my kids feel right at home. We enjoyed watching the Incredibles 2 with all of the other families. Cinebistro is kid friendly until 6 p.m. The next time we go back I promised to take them to Bowlero. On Mondays they have $14.19 unlimited bowling and shoe rental. 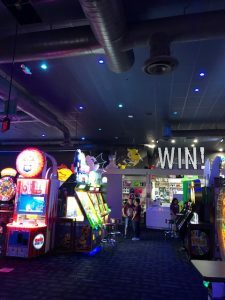 Bowlero is really cool too because they have laser tag. Cobb theaters will offer free admission to kids every Tuesday, Wednesday and Thursday at 10 a.m. so you definitely should check that out. The Stew Crew had a blast and can’t wait till we plan our next Dolphin Mall outing. For more information you can visit www.shopdolphinmall.com!! !